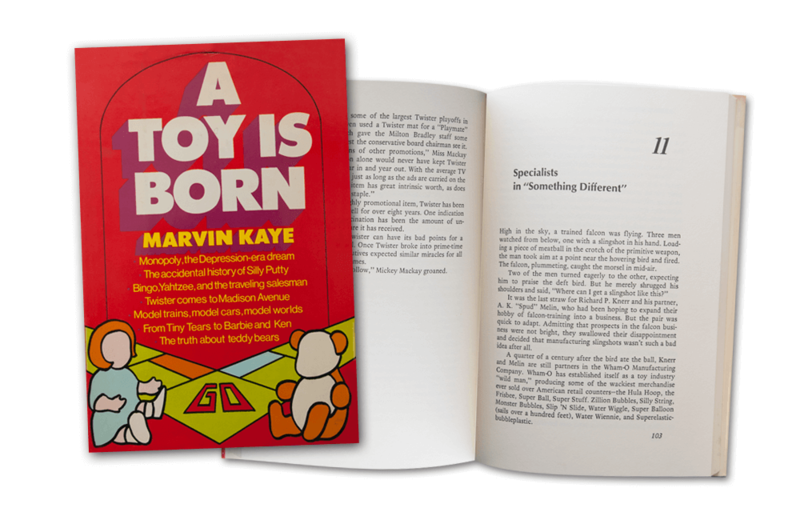 First published in 1974, A Toy is Born is still an enjoyable read for anyone interested in a “behind the scenes” look at the origins of some classic toys and games. During his 190-page journey, author Marvin Kaye delves into the personalities and circumstances that led to the invention and early marketing of a variety of well-known playthings, including Bingo, Yahtzee, Monopoly, Twister, Scrabble, Lionel trains, and Matchbox die-cast cars. Kaye’s work and the industry knowledge he gleaned as a senior editor at Toys, an industry trade publication, is evident throughout the book. Many of his anecdotes are embellished with snippets of dialogue from inventors and various toy industry insiders. Now 40 years since its first publication, reading the book and Kaye’s insights has the feel of opening a time capsule. For example, the chapters on toy safety and advertising at the time are a fascinating peek into the past. In the chapter entitled, “Housecleaning Project: TV Commercials”, Kaye chronicles the rise of the Boston-based consumer organization Action for Children’s Television (ACT) and its impact on children’s television advertising at the time. Guidelines used by the National Association of Broadcasters (NAB) to evaluate toy commercials are also discussed, with a running commentary from Bob Keeshan, a.k.a. Captain Kangaroo. The book concludes with a chapter called “The Great Witch Hunt” that focuses on toy safety. Kaye traces the advent of the Child Protection and Toy Safety Act of 1969, the ripple effect it had on the toy industry as a whole, and his reflections on the “journalistic witch hunt” that ensued. Toy World magazine is the UK's biggest trade publication produced specifically for toy and game manufacturers, wholesalers, retailers, and industry influencers.